Wander into any grocery store and you’ll find one aisle branded with a vague “ethnic foods” sign overhead, offering a dismal selection of Sriracha bottles, generic fish sauce, and a row of Styrofoam cup noodles with two exciting flavors to choose from: chicken and beef. Sometimes, if you’re lucky, there will be a shrimp-flavored cup in the mix. But I didn’t love Marukai, and consequently love being Japanese, until I saw the place with my own two eyes. In the era of my life known as Before Marukai, I was like so many other seven-year-old minority kids: ashamed of my culture and desperate to fit in with the majority. Back then, the moment my mom announced we’d run out of nori was a delicious one. For those few seconds, I allowed myself to fall into a fantasy as sugary as a kids’ cereal commercial, a fantasy in which I could stride into my first-grade classroom with the widest of grins on my face, confident that there wouldn’t be any bits of dried seaweed wedged in between my massive two front teeth from that morning’s breakfast. A fantasy in which no nori meant that we would soon exhaust our other strange Japanese ingredients as well, and I could finally tear into the breaded skin of a Smucker’s Uncrustables sandwich any time I wanted and know that I didn’t just pass among the other children in my neighborhood, with my stringy brown hair and round, light-colored eyes — I was truly one of them. But then my mom said, with cheery resolve, that she’d just have to add “more nori packets” to her grocery list, bringing my reverie to an abrupt end. Among the names of the apple pie-American grocery stores I knew — Vons, Ralphs, Albertsons, Stater Bros. — Marukai sounded like the obvious answer in a “one of these does not belong” series; not the odd brother of the family, but further removed. A second cousin, maybe. I’ll never forget the waves of emotion that hit me during my first Marukai visit: shock, anxiety, awe, relief. In my wildest dreams I couldn’t conjure a market that could hold so many Japanese goods within its walls, and not just groceries, but appliances, stationary, cosmetics, those colorful bath towels my mom gave my brother and me to scrub our backs with in the shower. I realized that a person could replace their rice cooker, find all the ingredients for an okonomiyaki-making session, and sample a few face serums all in one shopping trip, and my little kid shoulders felt heavier with that knowledge. Marukai was originally founded as an import company in Osaka, Japan in 1938, and didn’t branch out into markets until Marukai Corporation USA set up its headquarters in the Los Angeles suburb of Gardena in 1981. Until recently (when it was overtaken by its neighbor Torrance), Gardena had the largest population of Japanese in the mainland U.S., a suburban Japantown if there ever was one. 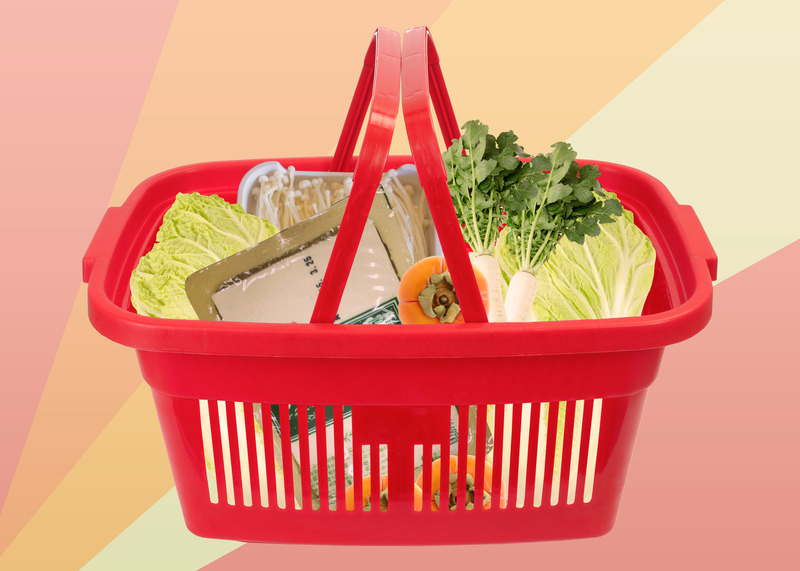 Japanese and Japanese American families flocked to Marukai to purchase familiar foods and household items. Word spread throughout the community in Southern California, and soon, people from outside the South Bay and even Los Angeles County began making the drive to stock up on supplies, my family included. Some even migrated from San Diego, more than a two-hour drive away. Once I was able to look past the overwhelming vastness of the market, I began recognizing items resting on shelves and behind refrigerator doors. Here were the squeeze bottles of Kewpie Mayonnaise with the baby doll stamped on the front, creamier than any American mayonnaise I’ve ever had and used as a salad dressing in our household. Over there stood the glass jars of furikake, that genius blend of fish flakes, sesame seeds, and nori strips we sprinkled over everything. In the refrigerator, I saw a stack of containers holding umeboshi, the pickled plums my mom adored but we kids detested. 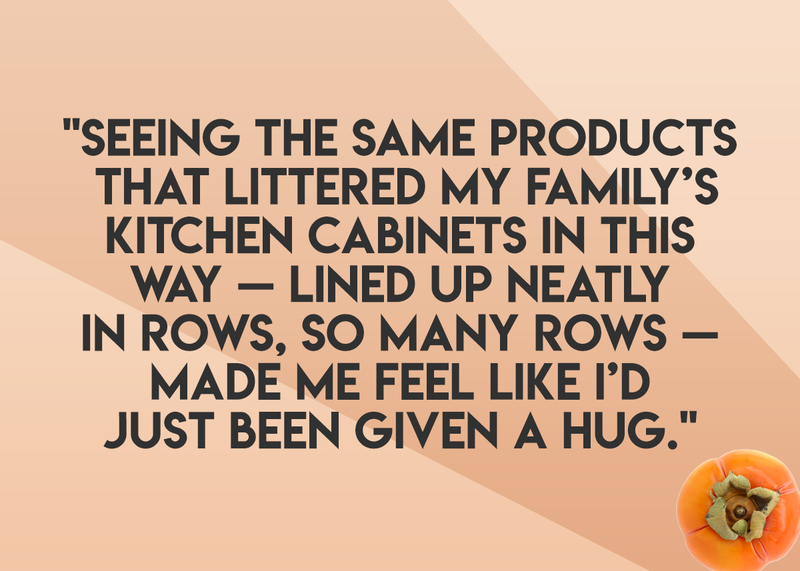 Seeing the same products that littered my family’s kitchen in this way — lined up neatly in rows, so many rows — made me feel like I’d just been given a hug. Here was proof we weren’t the only family eating this stuff. There were literally dozens of the same packets of senbei, the rice crackers I munched on at home, to suggest that other people enjoyed the same food we did. 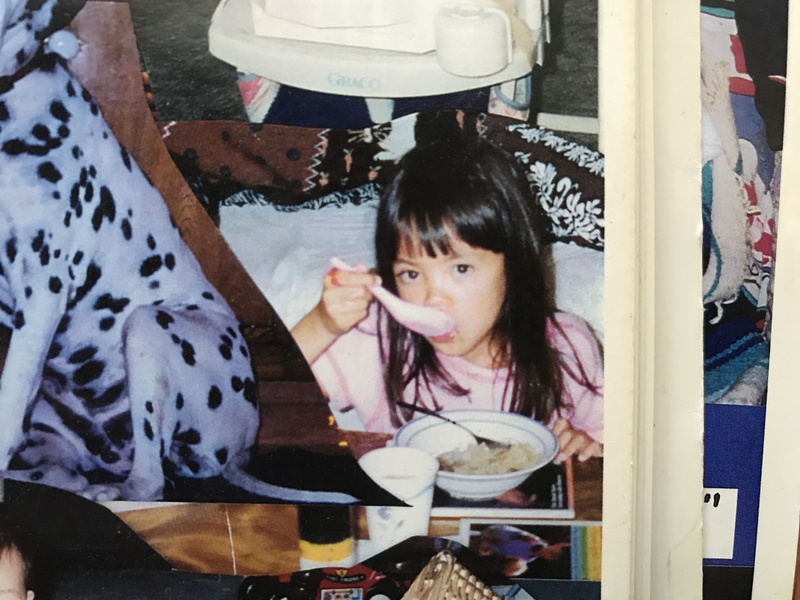 After that first visit to Marukai, from time to time I would imagine another little girl who looked like me living her life somewhere, snacking away in her room while practicing her times tables, and my heart would swell. Years later, in seventh grade, I would unwrap a Japanese fruit chew in English class, which would prompt the quiet girl behind me to tap my shoulder and tell me those were her favorites. She was half-Japanese like me, and we bonded over our similar upbringings. She’s one of my closest friends today. 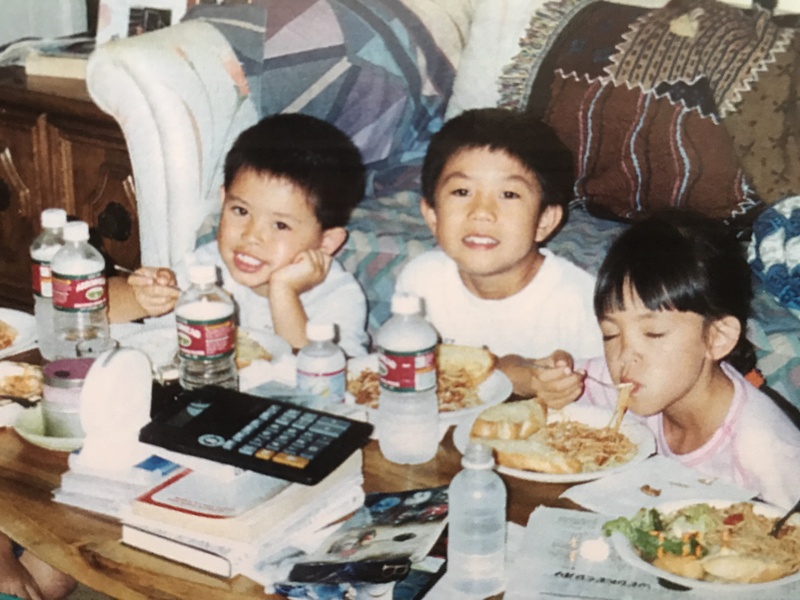 While I didn’t personally know other kids who ate the same food I did, much less kids who removed their shoes when they entered their homes, I saw lots of them during the Marukai visits I’d make with my mom. They were all Japanese, and just as I was shocked by seeing so many Japanese products, I was also surprised at how many Japanese children there were in the store. Sometimes they’d stare at me and turn to speak to their mothers in Japanese, and I’d suddenly feel distant from them, as if separated by an ocean and not a register lane. I was fourth-generation Japanese American: Yonsei, as I would later learn to identify. I didn’t know the language; I pronounced the food-related words I did know incorrectly. My mom had grown up speaking Japanese with her grandmother, my great-grandmother, but lost her ability once she moved from Hawai’i and stopped practicing. But there were other times when I’d see a white mother walking hand-in-hand with her mixed son down an aisle, or notice an employee bagging our groceries, who did not seem to be Asian at all, and remember that I was not in Japan, but in the diverse land known as Southern California, where I was not alone in my layered identity. I was at a stage of my life where I felt I needed to strictly define myself, but realizing that I was growing up in a place where being American meant so many different things allowed me to slowly relax into my skin. Once, I watched a young couple at the store, both Japanese. The man picked up an iced coffee can, squinted at the characters printed on the label, and asked his wife if this was the drink they had last time, to which she threw up her hands and replied, “I don’t know, honey, I can’t read it either!” Another stranger nearby, a woman my mom’s age, looked over and grinned, and they all started laughing, united in this shared, unspoken struggle: the struggle a people experiences when they know only one home but are constantly told by others that their home is a foreign place they’ve never visited, the struggle of not quite fitting into any available box, the struggle of a diaspora. I didn’t know it then, but this everyday activity of grocery shopping at Marukai with my family, rubbing elbows with other Japanese American families, was my earliest form of participating in community. This grocery store-as-community experience extends beyond Marukai, and even other Japanese markets I’d discover later, like Mitsuwa and Nijiya. Once I got to college, at a predominantly Asian university in Southern California, and befriended peers of other ethnicities, I was introduced to places like H Mart, the largest Asian American grocery chain, most frequented by Koreans, and 99 Ranch Market, where my Taiwanese friends shopped. Tagging along with my Korean American friends to H Mart on one of those late-night snack runs so many college students are familiar with, I gaped at the fresh fruits I’d never heard of while my friends bickered over which brand of this was best and if that would be okay to add to the japchae they were going to make. I was surrounded by the foods of another culture for the first time, but for my friends, this was just an errand. 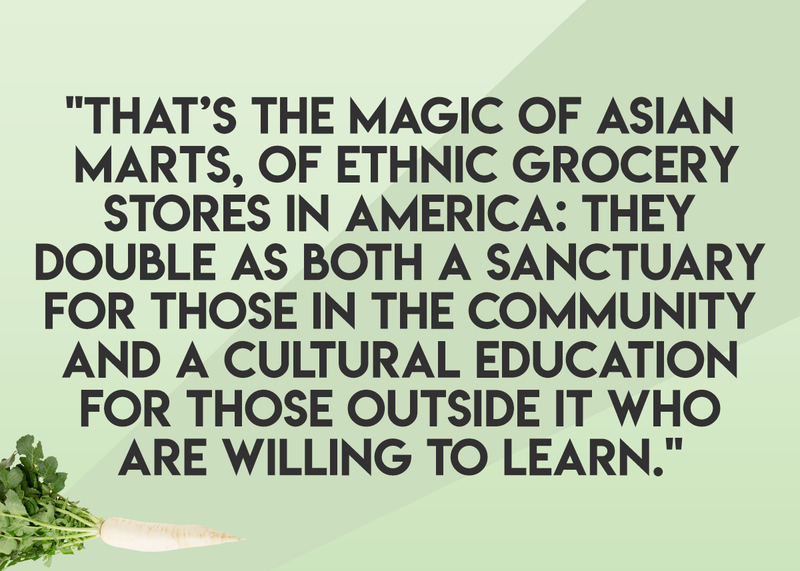 That’s the magic of Asian marts, of ethnic grocery stores in America: They double as both a sanctuary for those in the community and a cultural education for those outside it who are willing to learn. Of course, a community is more than just the food it offers, and you could call it cultural tourism, but I always felt that experiencing something first-hand, waiting for the automatic doors to part, stepping inside, grabbing a basket, was more personal, and thus longer-lasting, than any article I could read. Marukai today is a bit different from the Marukai of my childhood. In 2013, the comany was acquired by Don Quijote, a popular Japanese discount chain, and some of its locations were rebranded as Tokyo Central. These stores sell the same products Marukai did, but soon I began to notice a spread of English, both written on food tags and spoken by employees at the sample tables, in what seems like an effort to reach a larger audience: multicultural customers. Today I work in Los Angeles’s Little Tokyo, the heart of the Japanese American community in Southern California, and there is a Marukai just down the street from my office where my coworkers and I walk sometimes to buy cheap lunches. There was a location ten minutes from my university, too. The fact that there has always been a Marukai store close by throughout my life is not lost on me. I equate it to bringing my baby blanket with me to every sleepover throughout elementary school: I don’t necessarily need it, but it’s a comfort. Now when I drive past a Marukai, or a Mitsuwa, or even an H Mart, I can’t help but feel anchored to whatever city it’s located in. The random shops, apartment complexes, and houses become familiar, more inviting, and I already feel a kinship with their residents, even though I don’t know them. It may not be logical, but home is more of a feeling than a concrete place, after all. On an afternoon during a recent work week, I walked to Marukai to buy senbei, a snack to share with my coworkers. I weaved my way through the crowd, past older Japanese folks buying their groceries for the week, past office workers of various ethnicities on their lunch breaks, past a group of teenagers dressed in anime costumes, excitedly poring over the selection of cute plush keychains, and I turned straight to the second aisle from the right, where I knew my favorite snacks were waiting.